You may think having a beer or a gin and tonic in the evenings is harmless, but did you know that too much alcohol consumption can put you at risk for developing oral diseases? No one likes to think about cavities, gum disease, or cancer, but if drinking alcohol is part of your normal day-to-day, you may want to swap that next beer for water. Let a dentist in Memorial explain just how alcohol can increase your chances of bacterial diseases developing in your mouth. Good and Bad Bacteria: What’s the Difference? While you might assume that all bacteria is “bad,” you’re wrong. Although the word tends to have a negative connotation, there are actually good forms of bacteria that can help you maintain wellness and even prevent cancer. An example is Lactobacillales, which is considered a good form of bacteria because it prevents sickness. 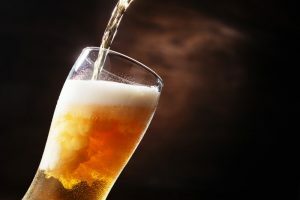 Researchers at NYU School of Medicine discovered those who drink alcohol on a daily basis have a poor combination of oral microbes. Individuals who are considered heavy drinkers have less of the good bacteria in their mouths and higher levels of harmful bacteria such as Bacteroidales, Actinomyces, and Neisseria. When an individual has more harmful bacteria existing in their mouth than good bacteria, it can lead to cancer of the mouth, throat, and even pancreas. Since alcohol can damage the cells in your oral cavity, they may try to repair themselves. This increases the likeliness for changes in your DNA, which can lead to cancer. Heavy drinking can also be contributed to increased risks of gum disease, heart disease, and head and neck cancer. If you’re wondering what is considered “heavy” drinking, U.S. health officials have designated the recommended limit to be that of one drink per day for women and two for men. Dehydration: When drinking heavy amounts of alcohol, you run the risk of becoming dehydrated and decreasing your saliva flow. When your mouth fails to produce enough saliva, bacteria can build and cling to the enamel on your teeth, increasing your chances for tooth decay. It’s important to remember that while enjoying a drink or two, you should drink water to keep yourself hydrated and flush out any bacteria. Sugar intake: Do you enjoy the taste of sweet wine? While it may taste good going down, the sugar left behind can cause a breeding ground for bacteria. As it builds in your mouth, plaque and tartar can grow around the gum line and lead to gum disease (periodontal disease). If treated early (gingivitis), it can be reversed. However, if it advances, you will have what is called, “periodontitis,” which can cause tooth and bone loss. If you’re thinking about reaching for another beer, you may want to stop and think about its effects on your oral health. Alcohol can be a dangerous substance that can lead to severe and even fatal consequences.